Ambiance Interiors offers a bespoke, personal yet friendly, interior design service i Bristol, Bath and the surrounding areas. We offer both traditional and contemporary schemes, from single window treatments to complete concepts. Our interior design service can provide lamps, furniture and one-off pieces, as well as fabrics ranging from £25 per metre, to top end designer brands. Ambiance Interiors has been established since 1992, based in the Bristol and Bath area, but willing to travel. We cover all aspects of Interior Design from Contemporary through to Traditional, from a single roll of wallpaper to a completely furnished house including the finishing touches, from cutlery to that perfect orchid! 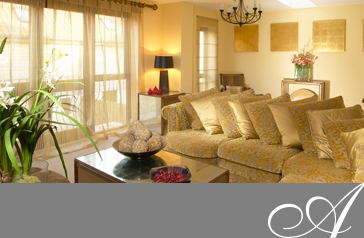 We offer an individual service customised to your specification with bespoke curtains, blinds, bedspreads, throws, lampshades and cushions. A postal service can also be arranged for clients happy to measure their own windows, with curtains arriving ready to hang after being made to measure. All in beautiful fabrics from fairly inexpensive plain silk to top of the range designer fabrics. We specialize in residential interiors, although projects have included hairdressers and show homes. We cover the whole of Bath, Bristol and the South West. Please contact us by phone on 01225 952522, or via our contact form, for help with your design project, with no initial consultation fee within the local area.